Hamlin Bank and Trust Company, based in Smethport, Pennsylvania, offers convenient locations, along with a variety of financial and trust services including online banking and ATM debit cards. 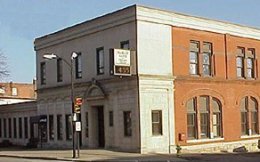 Established in 1863, Hamlin Bank was the first bank to service the communities of McKean County, Pennsylvania. A family friendly bank, their services include safe deposit boxes, night depository, cashiers and travelers checks. Apply for their MasterMoney Debit Card for the ease of check free purchases on the go. These cards can be used at participating ATMs for convenient and easy access to your money. Other services include telephone banking where you can review your account transactions, get current account balances, fax account information and transfer funds between accounts.